Is that Cannoli hash? In 2010, Richard Lee proclaimed – during the failed Prop 19 campaign – that the Emerald Triangle cannabis industry could only survive legalization if it learned to process outdoor cannabis into fine hash. Although HU feels Mr. Lee was wrong (and still is), hash making is a major part of the cannabis industry – and hash makers are the artisans of the process. High Times devoted an issue to concentrates in July 2014. The issue contemplates the benefits of concentrates to its (conscious) users, the momentum of the industry, and the dangers of its production and consumption. Senior Editor Bobby Black ends the article assured that concentrates will exist post-legalization, just highly regulated. He introduces a handful of the industry’s top extraction experts – the “kings of concentrate” – but doesn’t mention any old school hash makers who practiced this ancient art prior to BHO. But now, us flower power purists, have our king. 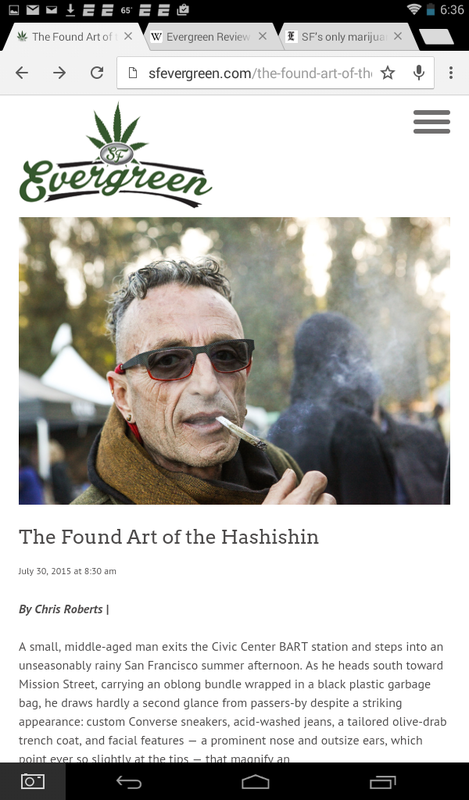 In an article by Chris Roberts in the SF Evergreen – not be confused with the Evergreen review of the 60’s, this is an up and coming cannabis focused publication out of San Francisco (much like Emerald Magazine of Humboldt) – we meet Frenchy Cannoli – a French hash artesian schooled over eight seasons in Pakistan (http://www.sfevergreen.com/the-found-art-of-the-hashishin/). Upon reading this article, HU’s collective eyebrows rose because we first met Mr. Cannoli on the VIP stage of Wonderland Nursery’s Ganjier Spring Kickoff, he was introduced as Aficionado Seeds official Hashishin (which is mentioned the article). Mr. Cannoli also contributes for The Ganjier out of SoHum where he has written about cannabis branding (http://www.theganjier.com/author/frenchycannoli/). He is also working with Emerald Growers Association to create a “hash-makers guild.” Ladies and gentlemen, the man is moving and shaking (thumbs up). Frenchy is an exemplar of the people of the cannabis industry. 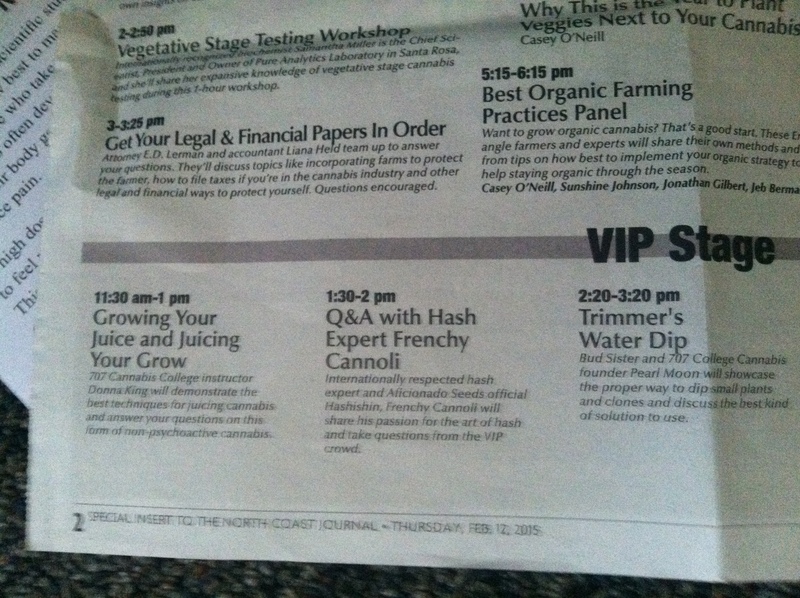 Mr. Cannoli is a hash-making expert and he came to Northern California in order apply his craft. He came here to work with quality product and industry. He is an expert and fast becoming a celebrity. His method is pure and simple – no butane, no extractors; only screens, water, and elbow grease. Frenchy is the Man and HU hopes that Mr. Cannoli is the first splash of a wave of currently unknown talent in Northern California. Lets just hope that he keeps rep-ing the Emerald Triangle and doesn’t defect to The Bay. Chocolates Co-ops etc? Waking up and sitting down to read and drink coffee, HU noticed something peculiar about the chocolate bar packages we had purchased and consumed the night before. The inside of the wrappers were more intricate than the outside; offering a plethora of info and visuals. 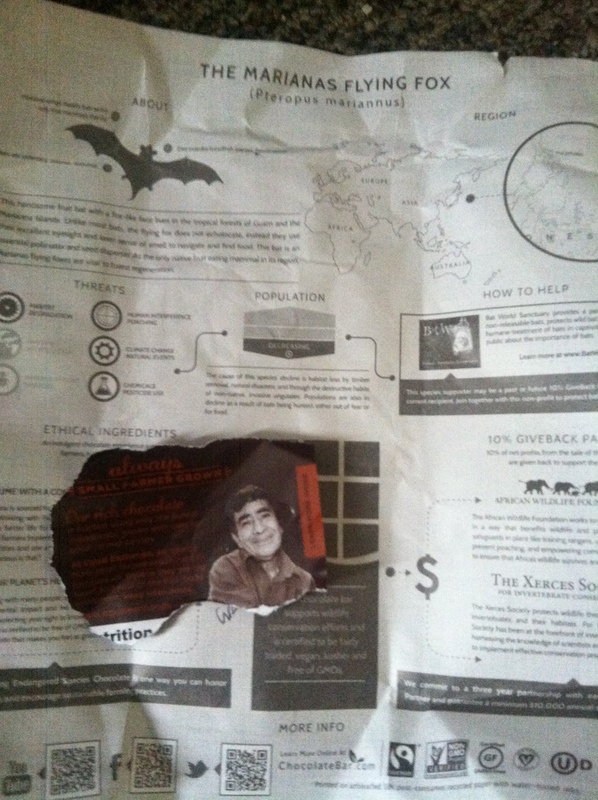 The dark chocolate with caocao nibs educated its readers about the plight of the Marianas flying fox and their necessity to the forest. Their habitat, region, population, threats, evolution, and cure were all laid out for the reader and conscious chocolate eater. Ten percent of the proceeds of this bar are donated to saving these bats (sorry, I meant cute flying foxes – better PR). The other bar was devoted to saving small farmers in Ecuador. Wow! What conscious munchies choices we made! The chocolate bar was produced using caocao grown by small farmers in Ecuador and pronounced its devotion to fair trade movement ideals. This bar was apart of the Equal Exchange Coop (equalexchange.coop), which promotes equal and fair trade between farmers and consumers – farmers get fair pay and consumers get quality food they can trust. Now that’s cool! As the caffeine and THC converge, we think: can Northern Cali do something similar? Can we sell quality, trustworthy cannabis at a premium price and maybe give some of our proceeds back to protecting our local environment? That would be cool… Along these same lines, HU recently read Emily Brady’s book: Humboldt Life on America’s Marijuana Frontier. One of the books main characters offers a story about Steve DeAngelo of Harborside Health. In the story she takes her outdoor directly to Steve and demands the same price as indoor, at which point she is politely refused. She later goes on to tell that her persistence – although didn’t get her premium dollar – got her a higher price and appreciation of Humboldt’s sun-grown cannabis. Now Harborside Health has a SunGrown brand of cannabis, which is purported to be conscious and save the environment. The story goes like this: outdoor cannabis farmers from “War on Drug torn regions” of Cali provide their cannabis to Steve and Steve offers them protection and fair pay (wait, that sounds like the mafia… oh well…). 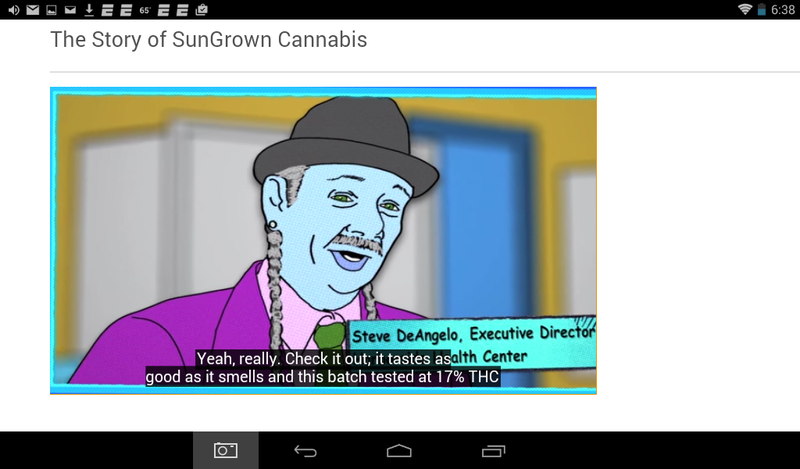 Check out this video, it features a hilarious cartoon portrayal of Mr. DeAngelo as he tells us about the history and benefits of outdoor “SunGrown” cannabis (www.harborsidehealthcenter.com/learn/SunGrown-cannabis.html). HU doesn’t quite know how to interpret this type of marketing. Is it lip service or the emergence of a appreciation of outdoor ganja? Lastly, here are some short notes of the peculiars… Flipping through the mail we noticed a mailer from Partnership Healthplan of California. Titled OUCH: Safer Management of Chronic Pain, this brief informative packet outlines how to manage pain while minimizing dependence on painkillers. Nowhere is cannabis mentioned… the same week the National Bureau of Economic Research (NBER) reported that medical cannabis states have seen a decrease in pain medication and opioid-related overdoses. Come on western medicine; get on board the cannabis express – you seem irrelevant at times. After a night of drinking beers and smoking spliffs a HU friend launched into a rant about legalization and the central valley. Let me tell you, he is sick and tired of hearing you people say that cannabis farming will relocate to the central valley once legalization is implemented. “It’s a F—ing drought.” And he may have a point: with cannabis farming already located in Northern California, it might be economically, environmentally, and ecologically ergonomic for California to just clean it up and organize it’s cannabis industry where it already is (thumbs up). The industry has evolved here (Humboldt) and as Michael Pollan argues in the Botany of Desire: maybe the plant has found it’s new evolutionary home (symbiotic relationship) with the residents of Northern California. Then there’s John (same John from the July 22nd Underground Review), again in the Lost Coast (Crime Report) Outpost, this time with a way forward for Humboldt: A War on Drugs museum… Now, I don’t know what a War on Drug museum might look like (according to John, tourists of Humboldt could reenact the War on Drug years by carrying sacks of soil to pretend grow op’s while helicopter noise is blasted over speakers (no lie), like some post modern civil war enactment), but it could work. We’d go… Sounds like the coolest museum we’ve ever heard of… Cool story John!